Sterling silver, Black Inlay, and Mother of Pearl. Rangers main belt buckle measures approximately 1-5/8" long and 1-5/8" at widest point, the two center pieces measure 1-1/8" long and 5/8" at widest point. The tip end measures approximately 1" long and 1" at widest point, and will fit a belt that is up to 7/8" wide. This belt buckle weighs approx. 57 grams. Feast your eyes on this splendid belt buckle! This ranger belt buckle is handmade out of genuine sterling silver along with real Mother of Pearl and Black inlay. 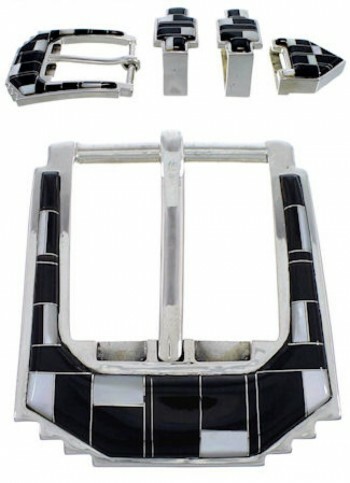 The belt buckle is made up of FOUR pieces; each piece has inlay that is carefully set, while thin silver lines can be seen in between for a stunning finish. Ranger belt buckle is stamped sterling and hallmarked.